Powers/Abilities: Clairvoyant. Possesses enhanced senses, specifically super-vision and hearing. History: (Marvel Mystery Comics #29) Mary Morgan was present when the Patriot thwarted a German plot to sabotage a shipyard. 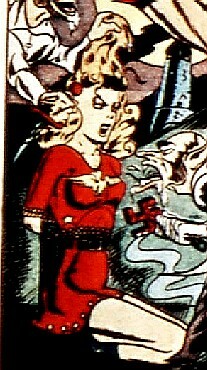 (Marvel Mystery Comics #50) Taken captive by Dr.Groitzig and Signore Scharrolla, Mary Morgan was used as a test subject for their super-soldier serum. This backfired for the villains, as it worked all too well and she gained superhuman senses. Inspired by the Patriot, whom she had often encountered, she created the identity of Miss Patriot. 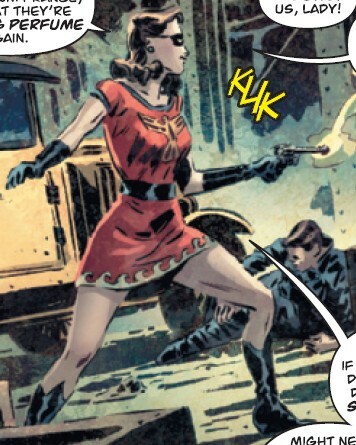 (Agents of Atlas #1) FBI agent Jimmy Woo, charged with putting together a team of special agents to combat the Yellow Claw, looked up the files of several superheroes considered potential candidates, including Miss Patriot's dossier (presumably meaning she was still active into the 1950s). Comments: In the original Golden Age stories, Mary never actually called herself Miss Patriot, though the text of the story did. 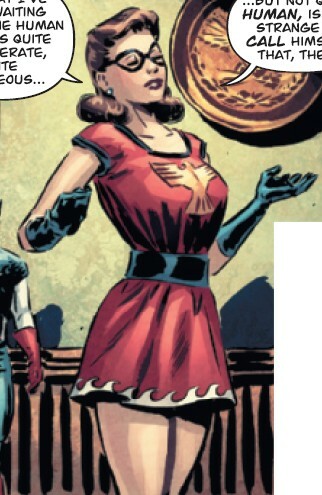 Although there was the stated intention of her being the Patriot's new sidekick, by the next issue of Marvel Mystery Comics she seemed to have lost her powers, and her costumed identity was not seen again until 2010, when she reappeared, now actually using the costumed Miss Patriot identity and fighting crime, in Captain America: Patriot. T hanks to Jess Nevins for allowing me to use information from his excellent Golden Age Heroes Directory and his Guide to Golden Age Marvel Characters. Thanks also to Richard Boucher & Darrin Wiltshire @ PR-Publications for permission to use information from their equally brilliant collection of Golden Age Sites, PR Publications. Their knowledge of Golden Age characters far outstrips my own.